I have found something that has been on my mind ever since Jane's post about the Pikes Peak Weavers Guild coverlet project. I knew it was packed away somewhere. When I commenced my spring cleaning project, I decided to find it and get it out. And here it is, my very own family heirloom antique coverlet. 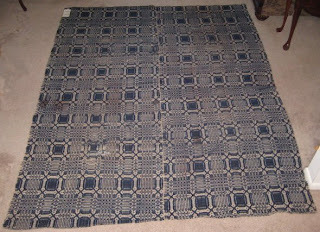 This coverlet resided on the single bed in my grandmother's sewing room for as long as I could remember. Eventually it was passed on to me, I think because I was the only one of nine grandchildren who had an interest in textiles. I am uncertain of the pattern. The center motif (pictured on the right) looks like a variation of Thousand Flowers (see the "Orange Blossoms" draft in Marguerite Porter Davison's A Handweaver's Pattern Book, page 114). Those first photos may look pretty good, but in reality, it is very worn and dirty, not to mention having a few flaws. The length is 96 inches. The width is 77 inches. Like most coverlets of its time, it is actually two loom width panels sewn together. You can see this coverlet's seam quite clearly as the pattern on the two panels is quite mismatched. .....make me wonder. Was it was a young weaver's very first coverlet? Or was the need for blankets so pressing that the weaver rushed to complete it without care? I'll probably never know. In fact, the needle and thread (lower right) were left in it from before when I received it. Blood stains? All of this just makes me more curious as to it's story! Who wove it and when? To that I do have a clue. "Woven by W. A. Paine's Great Grandmother. Oral Paine Wilson's great, great grandmother. " 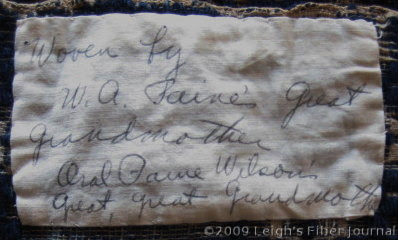 Oral Paine Wilson was my paternal grandmother and this tag is in her handwriting. W. A. (Winslow Austin) Paine was her father. I've done some genealogical research, and so have some clues. Winslow A. Paine was born in Wellfleet, Massachusetts in 1871. I have been able to find information on his grandparents (all from Massachusetts) and one set of great-grandparents: Nathan Young Paine (1794 - 1879, Wellfleet, Mass) and Dorcas Cole Lombard (1798 - 1885, Truro, Mass). Wellfleet and Truro are villages on the Cape Cod peninsula. 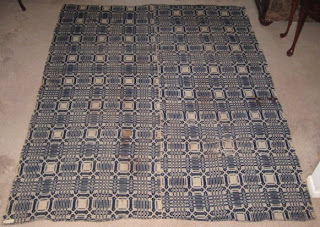 I don't know which ones were weavers, but at least from this information I can guesstimate that the coverlet was woven in the early to mid-1800s, most probably in Wellfleet, Massachusetts. My coverlet may not look like much, but it is a treasure to me. It is so worn I'm not sure how well it could be cleaned, nor whom I would trust to do it. For the time being it will just remain as it is. I can understand that you value it, even if it's not done perfectly! it doesn't matter as it was apparently appreciated by your ancestors - steeped in history! somehow I find that used looking things are far more approachable than perfect textiles that look as if they should be in a museum! 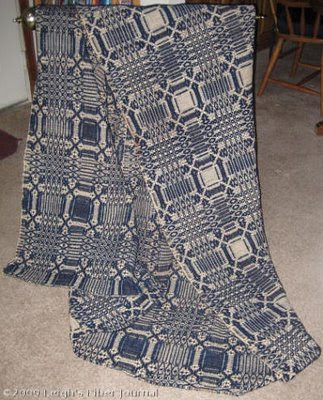 and you could always try to figure out the pattern a bit more and work on a blanket similar to this? That is a lot of singles and energized twist to deal with!! I give the weaver a great deal of credit. In our instant clothing society, we forget how precious textiles were in earlier times. Thanks for posting pics of that coverlet!! I've seen old perfect ones, but never old coverlets that have been used. It's beautiful!! You are so fortunate to have such a family treasure. Your coverlet may not be perfect but so few that were actually used are. 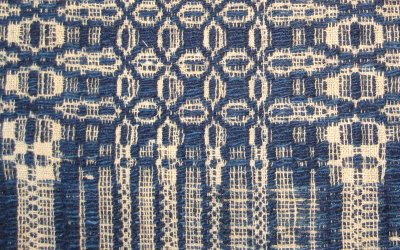 As a weaver I can relate more to an overshot coverlet than a jacquard. Great pictures. Thanks for share part of your family history. Oh Leigh how exciting!!! And to have the clues to the weaver, even better! It are the flaws that make it most valuable and exciting -- This is a classic example of what in my mind I think of as a "Year's Coverlet." Not meaning the design, we'll get to that later -- but the time involved. 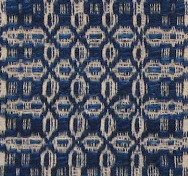 The weaver, no doubt spun her her own yarns, then indigo dyed the blue, plotted out her pattern from one most likely swapped with friends and/or relatives -- then when winter arrived, spent the entire winter weaving it. It used to take a home weaver roughly a year from sheep to coverlet. The imperfections make it wonderful and you will see the same in many museum pieces. It was woven with a lot of love and patience, and may have been one of her first ones. How exciting!! So many of these old coverlets are in far worse shape and tattered into pieces. Cleaning can indeed be tricky and you don't want to have it dry cleaned. Feel free to email me for some tips on how you can safely clean it yourself. It's GORGEOUS! At first glance, it does look like a thousand flowers or a variation on Lee's Surrender. It looks as if it was treadled rose fashion, and has a familiar look to me. I was so excited about finally getting to see it, that I haven't looked closely yet to really study it. Which I am going to do now. Friday is our Guild's meeting, and I'll look through our collection of coverlet books to see if I can track down more on the pattern. YAY!! What an incredible treasure you have here made all the more so by knowing that its maker's hands are so connected to your own. Thanks so much for bringing it out and sharing! You know, it's actually heartening to me to see something that's NOT perfect. It means the maker was just a gal like me, doing the best she could with what she had. What an amazing family heirloom! Thanks for sharing it. Your coverlet is fascinating and so is the Pikes Peak project! Patches! Possible bloodstains! You could have a DNA test done! As others have said, it makes me glad to have and use the things I make and glad to see that they are useful even if they are not perfect. Can you feel all those family members standing with you as you touch it? Such an amazing connection to your past. Wonderful! I can recall feeling much the same when my father passed onto me the family christening gown which has a long history as well. 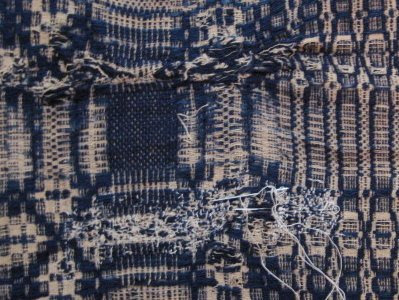 I have always had a fascination for ancient textiles and one of the 'ah, ha' moments was when Linda Heinrich (author, Magic of Linen) let me handle a section of handspun linen, handwoven on a warp weighted loom: a piece of 'mummy wrapping' from a crypt in the Valley of the Queens. It was plain weave with basket weave selvedges and a deep bronze yellow with age. Time travel in a heartbeat! Such history - what a treasure to have! It's beautiful, even with it's little flaws that are unseen to the "common eye" - What a treasure to have. :-) T.
What a wonderful find, makes spring cleaning worth it! I really wish I could trace my family history so well, you are indeed fortunate. 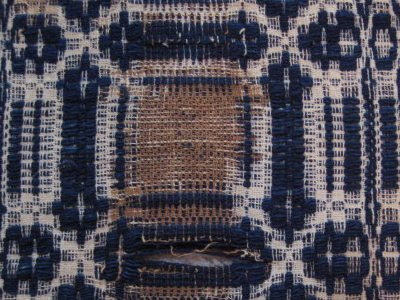 I have the Coverlet book by Helene Bress and it really goes into a lot of detail about eastern American coverlets, almost none of them were made perfectly, maybe its a case of function over form and we can take comfort in that aspect of historical weaving. It was very rewarding to see that the Pikes Peak W G Coverlet project inspired you to bring out your wonderful coverlet. Keep all of the documentation you have so that it maybe appreciated by people in the years to come. What an awesome find. I have some things that my grandmother knit when I was younger. I try not to use them for fear something will happen to them. I guess eventually I will get them out and at least have them out to look at them. I regret not learning more from my grandmother when she was alive. I treasure all those things now and feel very lucky I am the only one of two grandaughters. We got to split lots of things between the two of us. I even have a very old mink stole. Have no idea what to do with it, but I wore it as a child playing dress ups so it means the world to me. Thank you so much for taking so many photos of the coverlet. Its a tangible connection with the past and a beautiful piece of history.I have been reading and re-reading all your posts on Summer and Winter.I am getting a sample threaded upon the loom but feel a bit daunted.Should I stick to 4 shafts...I can't get my mind round 8 because of tie-ups.My yarn should arrive tomorrow but I will stick to my plan of experimenting first!! How wonderful for you to have a piece of your history! Coverlets were quite popular in this part of the world and quite a few of them ended up in the local museum. 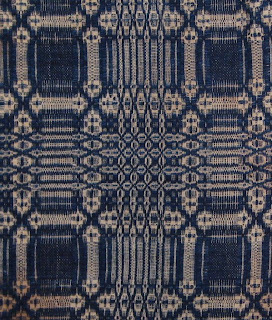 A number of years ago, our local weaving group set up a cooperative shop in the museum and reproduced one of the coverlets that they had. We were able to display it in the room where we were weaving and people found it facinating. It was quite a large repeat and had the same sort of missmatched panels and treadling errors. I wondered the same things that you wondered. New weaver, or cold weaver? What a jewel! And the history, too. Wow - that's a monster sized sample. I have a teeny bit of counterpane that my grandmother preserved behind the glass of a serving tray. I wish I had what she didn't preserve. She typed up a note and it's taped to the back: " A piece of counterpane made near Frankford, Ketucky about 1935 - by our Great Grandmother McPherson and our Granmother Sarah McPherson-Wilson. Made from the wool of this own sheep. Carded, dyed and woven by them." It's woven from the same blue and white singles. I am so thankful that she preserved this memory for me. I totally know how you feel. Hi Leigh, as promised, I've been pouring over our guild's coverlet book selection. On page 301 in the first book of Helen Bress'The Coverlet Book is a coverlet that is very similar to yours. The pattern in the small tables is a bit different (but that's not unusual as weavers of course put their own 'spin' on designs), but the overall look is the very much the same. Unfortunately, Ms. Bress doesn't give data on origin, etc. Gosh, I appreciate everyone's input. This is a fascinating area of study which I am barely scratching the surface of. Someday I want to weave my own. Sharon, it sounds as though you have your own bit of family history to treasure as well. Jane, thank you so much for the information! I will have to see if I can get my hands on a copy of that book. Perhaps in my genealogy research, I will discover who the weaver actually was. This is a beautiful piece of history. I have heard of historical coverlets, but not seen any as it's not a tradition in England, although I was lucky enough to see some old Welsh blankets last year - unfortunately with no information about their history. It is wonderful to have the coverlet and know some of it's history like this. Hmmm, I tried to post a comment here before but the blog sprites were against me... wonder why that is? I love the mismatch at the join, because it sets me to wondering what the weaver was thinking. Did she run out of yarn so she couldn't do another repeat? Or did she just want to get the thing off the loom and onto the bed? Did she not even consider the join until she laid out the pieces and thought uh-oh...? Wonderful to have a glimpse into the past like that! I see it's been awhile since someone posted but I just found your information and pictures! I take care of the textiles donated to one of the St. Louis County Parks and we have a coverlet similar to yours which we'll be putting on display soon. Unfortunately, we don't know anything about it. However, it was your luck in having the weaver's information that caught my eye. We have a quilt which is marked in the corner "Lydia A. Short done this". The quilt is not one of our oldest but it is so dear because of that label. I feel like many of those who posted that it's your coverlet's imperfections which make it so interesting. Thank you for sharing.